Take advantage of those cool Northern California evenings with a whole house fan. By sucking in cool outside air you can keep your house cooler in the evening and cut down on the amount of time you run your air conditioner. Ever wonder how to take advantage of cooler temperatures outside your home at night and reduce the usage of your Air Conditioner? The answer is a WHOLE HOUSE FAN. With a whole house fan, you can open up the windows at night. 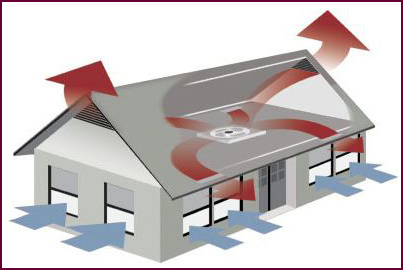 The powerful fan pulls air into your home and up through the attic, pushing the hot air out. During the day, your attic heats from the sun beating on your roof. At night, the attic retains this heat for hours, making it difficult to sleep and costly to keep your home cool. Keep your house and attic cool at the same time!